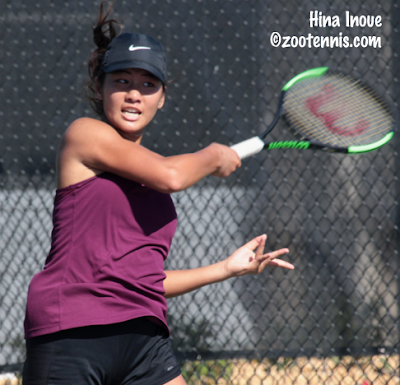 There was drama during the third round of the ITF Grade 1 Eddie Herr Championships, with four girls matches going three sets and No. 2 seed and defending champion Maria Carle of Argentina losing in a third set tiebreaker. 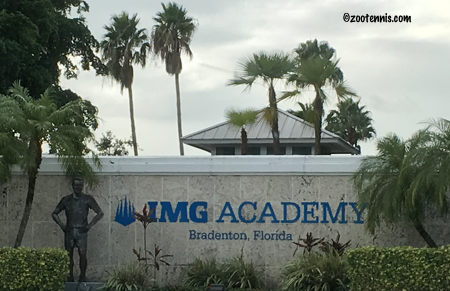 But the match that drew the biggest crowd and featured the most tension and controversy Thursday on the courts of the IMG Academy was the girls 14s quarterfinal between No. 1 seed Hina Inoue and No. 10 seed Dariya Radulova of Bulgaria, which ended with Inoue surviving all manner of challenges to claim a 6-7(5), 2-6, 7-6(8) victory. As with all the quarterfinal matches in the 12s, 14s and 16s divisions, the match began a 9 a.m., but was still going at 1 p.m, and Inoue knew from the length of the first set that it was going to be a marathon. "There was another girls match near us, 16s I think, and they had played two sets already and their sets were 7-6, 4-6," said the 14-year-old from Southern California, who now lives in Bradenton and trains at IMG. "Yeah, it was really long. In the second set, she just lobbed a lot and I missed a lot." Inoue trailed Radulova 5-3 in the third set, but such was her physical and emotional fatigue that she didn't recall whether she saved any match points as she fought her way into the tiebreaker. By then, with few if any singles matches still being played, a roving umpire was on the court most of the time, although a different umpire had relieved the first one when Radulova was overruled for a third time in the third set tiebreaker. "She called a ball of mine out that was in at 5-all," Inoue said. "And the [the umpire] called it in, so I was up 6-5. The [umpire] thought if it was the third overrule it was a point penalty(for unsportsmanlike conduct), so she called point, game, set, match. My coaches were like, it's match then. There was a long talk, and she was crying." That talk eventually involved calling to court the tournament referee, who is the only official allowed to default a player, and he determined that the ITF rules the tournament uses call for a warning, not an immediate point penalty, so the match resumed. Having to readjust mentally and starting to cramp, Inoue lost the next two points, but saved a match point at 7-6, a result that produced loud cheers from the dozens of IMG coaches and fellow IMG students stacked three deep at the fence next to the court. There was no cheering when Inoue won the final point of the match however, with Radulova double faulting at 8-9 to end the draining four and-a-half-hour epic. Radulova immediately dissolved into tears, a reaction Inoue understood. "She was actually really crying," said Inoue, who couldn't remember ever playing a longer match. "I would have been the one crying if I had lost." Carle's 1-6, 7-5, 7-6(6) loss to unseeded 16-year-old Clara Burel of France took place on the Academy Park courts, far away from the seven main Har-Tru courts adjacent to the Academy's hard courts. With Carle's loss and 14-year-old Clara Tauson's 6-1, 7-5 win over No. 5 seed Naho Sato of Japan, No. 1 Whitney Osuigwe is the only seed remaining in the girls quarterfinals. Osuigwe, the only American girl remaining in the draw, defeated wild card Katya Townsend 6-1, 6-4 to advance against Tauson in Friday's quarterfinals. 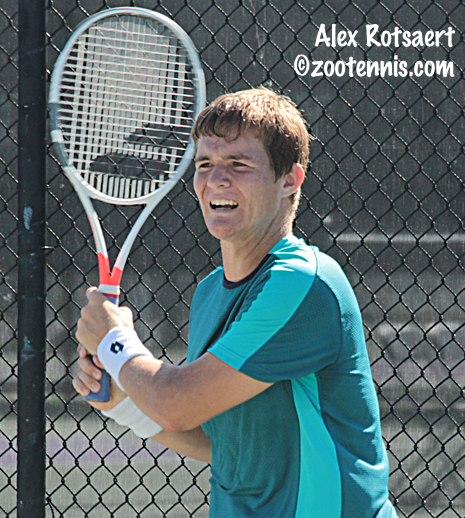 Boys top seed Timofey Skatov of Russia also advanced to the quarterfinals with a straight-sets win, beating No. 16 seed Filip Jianu of Romania 7-5, 6-1. He will face No. 6 seed Alexandre Rotsaert, who is playing the last junior events of his career this week and at next week's Orange Bowl. "I thought, before the Futures in January, there's no point to not playing them," said Rotsaert, who beat No. 12 seed Carlos Lopez Montagud of Spain 6-4, 6-4. "Matches, get confidence, implement what I've been doing in practice. These tournaments are at home, there's no travel," added Rotsaert, who is now training at Pro World Tennis Academy in Delray Beach Florida. Rotsaert got off to a rocky start this week, down 5-2 in the third against Andrew Paulson of the Czech Republic in his 2-6, 6-4, 7-6(0) first round win. "He was serving at 15-0 and I kinda dug deep, found my way back," Rotsaert said. "I actually won the last 11 points of the match, and I think I built confidence and started playing much better." Beating a Spaniard on clay is never easy, but Rotsaert looked comfortable throughout the match. "That guy's really good, I thought I played really well," said the Stanford recruit. "He puts lots of balls in play, so I'm really happy with the way I played. Stayed positive, putting lots of balls in the court and attacking the short ball." The other American in the quarterfinals is qualifier Ivan Yatsuk, who defeated Michael Heller, also a qualifier, 6-3, 6-2. Yatsuk will battle another player with a one-handed backhand in the quarterfinals, after No. 14 seed Stefan Palosi of Romania defeated No. 2 seed Uisung Park of Korea 6-7(7), 5-7, 6-2 in a three-and-a-half-hour contest. The doubles quarterfinals were completed Thursday, with the top two seeds in the boys draw eliminated. Park and Nicolas Mejia of Colombia, the No. 1 seeds, lost to Adrian Andreev of Bulgaria and Keenan Mayo 6-4, 6-4, and No. 8 seeds Alan Rubio Fierros of Mexico and Donstanbek Tashbulatov of Kazakhstan beat No. 2 seed Skatov and Aidan McHugh of Great Britain 2-6, 6-3, 11-9. Girls top seeds Osuigwe and Caty McNally advanced to the semifinals with a 6-2, 2-0 retired win over Denisa Hindova of the Czech Republic and Oona Orpana of Finland, but No. 2 seed Carle and Layne Sleeth of Canada lost to Viktoria Dema of Ukraine and Avelina Sayfetdinova of Russia 4-6, 6-2, 14-12. Although top seeds Whitney Osuigwe and No. 2 seed and defending champion Maria Carle of Argentina breezed through their second round matches Wednesday at the ITF Grade 1 Eddie Herr Championships, the rest of the draw is wide open, with No. 5 seed Naho Sato of Japan the only other seed still remaining. There may be only three seeds left, but there are two qualifiers and two wild cards still in the girls draw after second round action today at the IMG Academy. 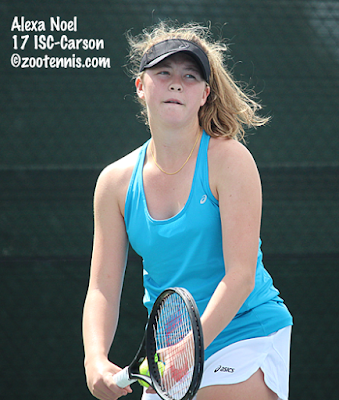 Katya Townsend defeated fellow wild card Ana Geller of Argentina 4-6, 6-2, 6-1 and will play ITF Junior No. 1 Osuigwe in an all-IMG Academy contest Wednesday. 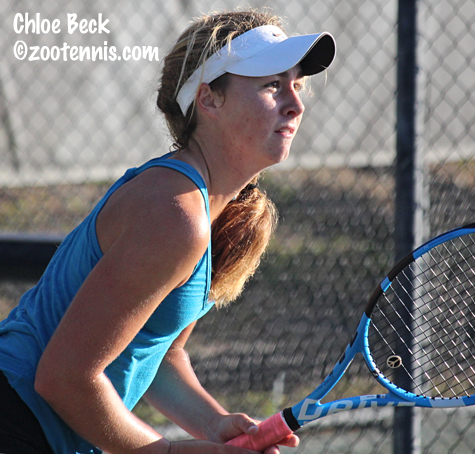 Wild card Angelica Blake, the reigning USTA 16s champion, reached her first Grade 1 third round, playing error-free tennis down the stretch to eliminate qualifier Chloe Beck 2-6, 7-5, 6-3. She will face qualifier Ziva Falkner of Slovenia, who advanced when No. 16 seed Karolina Berankova of the Czech Republic was unable to take the court this morning due to an ankle injury. Abigail Forbes has yet to lose a set in her five matches this tournament, with the qualifier taking out Peyton Stearns 6-4, 6-2. She will meet unseeded Viktoria Dema of Ukraine, who eliminated No. 10 seed Hailey Baptiste 3-6, 6-3, 6-4. Carle, a 6-1, 6-0 winner over Denisa Hindova of the Czech Republic, will play Carla Burel of France, who ended the Eddie Herr winning streak of 2016's 16s champion Katie Volynets with a 4-6, 6-1, 6-4 victory. The boys third round will feature ten seeds, as well as two qualifiers and a wild card. Top seed Timofey Skatov of Russia defeated Anton Matusevich of Great Britain 7-5, 6-1 and No. 2 seed Uisung Park cruised past Daniel Michaelski of Poland 6-4, 6-1, but the No. 3 and No. 4 seeds were eliminated. Sixteen-year-old Adrian Andreev of Bulgaria, an Eddie Herr 12s finalist back in 2013, defeated No. 3 seed Chun Hsin Tseng of Taiwan 6-4, 6-4 and 14-year-old wild card Martin Damm beat No. 4 seed Nicolas Mejia of Colombia 7-6(7), 7-6(5) in the most compelling boys match of the day. Damm, the son of the former ATP star of the same name, is competing in only his second Grade 1 tournament, but at nearly 6-foot-7, he doesn't look out of place among the older, more experienced players. He also does not feel out of his depth. "For sure I feel ready," Damm said. "Because of my size and my ground strokes, but also with my confidence. My ground strokes are there, so I think I'm ready to play with the big guys now." The match, played on Court 3, was being closely followed by a group of IMG coaches, as well as ATP great Ivan Lendl, who lined the chain link fence throughout the 2 hour and 45 minute match. Although Mejia and Damm both train at the Bradenton facility, Damm said he wasn't that familiar with the 17-year-old's game. "Sometimes I get called up with the older guys, to hit with them," Damm said. "I've hit with them quite a lot, but I haven't played him that much. The previous matches I've seen, he's a solid player, so I knew I had to play very well to beat him." In the first set tiebreaker, the left-handed Damm saved a set point with an ace at 5-6. Mejia saved a set point with a good first serve at 6-7, but with Damm getting another at 8-7, Mejia attempted a drop volley that he netted to end the 75-minute first set. Damm went up 4-3 in the second set and had game points for a 5-3 lead, but Mejia got the break back, with the match reaching peak intensity, as both players let out exclamations of "Si, Si, Si", "Vamos," "Pome," and "Allez" after nearly every point. Despite giving up the break and going down 3-0 in the second set tiebreaker, Damm kept calm, and earned his first match point at 6-5 with a forehand winner. Mejia got his first serve in and tried to sneak into the net, but Damm executed the forehand pass to seal the win. "I think I just took the opportunities I had, and I think I served a little bit better than him," said Damm. "I went for my shots, and I think that's what decided it." Damm believes his underdog status helped him. "He's around 20 in the world, I'm 400, so for sure the pressure's on him," said Damm. "He's a couple of years older than me, so for sure I played a little bit more free than I usually would, but I knew I had a chance and I could win this." There will be an American qualifier in the quarterfinals, with Ivan Yatsuk facing Michael Heller in the third round. Yatsuk, who had beaten No. 5 seed Tao Mu of China on Tuesday, got his first straight-sets win after four three-set victories, beating Jonas Forejtek of the Czech Republic 6-4, 7-5. Heller, who beat No. 9 seed and Yucatan Grade 1 champion Juan Cerundolo of Argentina Tuesday, beat Emile Hudd of Great Britain 7-6(7), 6-4. The other Americans remaining in the draw are No. 6 seed Alexandre Rotsaert and No. 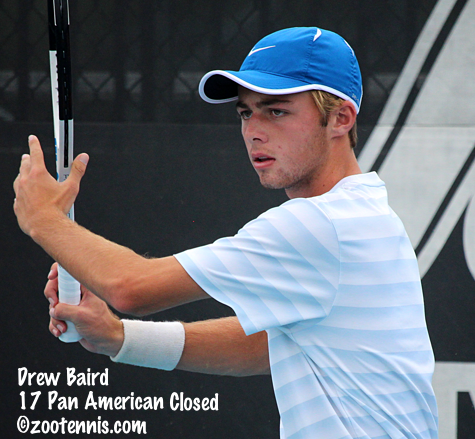 13 seed Drew Baird, the recent Grade A Abierto Juvenil champion. Baird defeated lucky loser Danill GLinka of Estonia 3-6, 6-2, 6-3 in a battle of one-handed backhands. The top seeds in doubles advanced to the quarterfinals, with Mejia and Park, the No. 1 seeds, and Skatov and Aidan McHugh, the No. 2 seeds, both winning in straight sets. The top seeds in girls doubles, Osuigwe and Caty McNally won in straight sets, while No. 2 seeds Carle and Layne Sleeth of Canada beat Lea Ma and Natasha Subhash 6-7(5), 6-4, 10-3. With excellent weather expected to continue through the week, the finals for the 12s, 14s and 16s are scheduled to be played on Saturday, with only the 18s singles finals on Sunday this year. See the TennisLink site for complete draws for singles and doubles. Six qualifiers advanced to the second round of the ITF Grade 1 Eddie Herr Championships Tuesday, with Chloe Beck and Ivan Yatsuk taking out Top 8 seeds on a warm and sunny morning at the IMG Academy. Beck, who had cruised through her three qualifying matches on Saturday and Sunday, needed over two hours to get by No. 3 seed Lulu Sun of Switzerland 7-6(3), 7-5, while Yatsuk, who won all three of his qualifying matches in three sets, stayed true to form, beating No. 5 seed Tao Mu of China 6-7(2), 6-0, 7-5. Beck, ranked 230, served for the first set against Sun, ranked 21, at 5-3, but was unable to close it out until the tiebreaker. Sun served for the second set at 5-3, but she too was unable to nail down her opportunity, although Beck's strategy had something to do with that. "A lot of times I can be stupid on clay and just start slapping balls," said the 16-year-old from Georgia. "But before the match, my dad told me I needed to mix up slices and lobs and not give her a slap, because on clay courts it doesn't work. I played smart." Beck described herself as a "nervous" player, but said her underdog status and her respect for Sun kept her from putting pressure on herself as she went to serve out the match after breaking for a 6-5 lead. "I've been working on that lately, trying to put less pressure on myself and look at it in a different way," Beck said. "So I was just thinking of it as a practice match, it doesn't matter who wins or loses, as long as I play my best and give it all my effort." Beck said that all the long points and close games took a physical toll, which ended up helping her as she went to serve it out. "It helped me kind of to relax," said Beck, who closed out the match with a love hold. "I was tired, I think we were both tired, because we had a long first set, and I was really relaxed, because my legs were kind of burning and I just went out there and tried to stay loose, and that worked." Beck was pleased with the result, but not surprised by it. "I'm really happy with it, but I don't think it's something I couldn't achieve," Beck said. "I went into the match thinking I could win. I wasn't like, oh my gosh, it's so crazy that I won this match. I go out there thinking I can beat everybody and today it ended up going my way." Yatsuk was not as successful as Beck in closing out his win, as he was unable to get to match point serving at 5-4 in the third in front of a large crowd on the porch overlooking the stadium court. But he managed to break Mu, ranked 34 to his 821, at love to get a second chance and this time he converted it, with Mu netting two forehands to end the match. "I thought I choked it for a second," said Yatsuk, a 17-year-old from nearby Sarasota. "But then I knew I could break him back right away because I was having chances in almost every game." Yatsuk was confident in his ability to come back after going down 3-0, two breaks to open the match. "I still got it back to 3-all," said the 6-foot-5 Yatsuk, who recently committed to University of South Florida. "And then I got to a tiebreak, and had chances to win it, so I had momentum. And after he went down 3-0 [in the second set], he took it a little easier to get ready for the third." Yatsuk said playing on the show court, with South Florida head coach Ashley Fisher and assistant coach Jimmy Arias looking on, did not make him nervous. "It helps me when a lot of people watch me," Yatsuk said. As for his one-handed backhand, Yatsuk said he has always had one. "It was just natural. I've always been comfortable with it." Other girls qualifiers who advanced to Wednesday's second round are Ziva Falkner of Slovenia and Abigail Forbes. Two additional boys qualifiers also advanced: Allan Deschamps of France and Michael Heller. Heller defeated No. 9 seed and last week's Grade 1 Yucatan Cup champion Juan Cerundolo of Argentina 6-1, 7-6(4). The first round of doubles was completed today with top girls seeds Caty McNally and Whitney Osuigwe and No. 2 seeds Maria Carle of Argentina and Layne Sleeth of Canada advancing in straight sets. In the boys first round of doubles, both the No. 1 and No. 2 seeds were pushed to match tiebreakers. Top seeds Nicolas Mejia of Colombia and Uisung Park of Korea prevailed over Tomas Kopczynski and Brian Shi, while Timofey Skatov of Russia and Aidan McHugh of Great Britain, the No. 2 seeds, got by Lleyton Cronje of South Africa and Sheil Kotecha of Kenya. In the four 12s and 14s divisions, the top four seeds all advanced to Wednesday's round of 16. (The list of the Top 8 seeds is available here). The boys 16s are missing only top seed Sebastian Rodriguez, who qualified for the 18s, so was replaced by a lucky loser. The girls 16s draw still has top seed Maria Rivera of Guatemala and No. 4 seed Hye Ran Yun, but No. 3 seed Savannah Broadus joined No. 2 seed Natasha Sengphrachanh of Canada on the sidelines today. See the TennisLink site for all the second round results. The USTA level 1 National Indoor Championships, played this year for the first time since 1999, concluded on Monday at eight sites around the country. I've added the singles and doubles champions to the Honor Roll at the left side of the Zootennis home page. The complete results of all finals, including players hometowns, can be found in the release the USTA sent out today. World No. 1 junior Whitney Osuigwe and defending champion Maria Carle of Argentina had no difficulty in their first round matches Monday at the ITF Grade 1 Eddie Herr International. Osuigwe, who is playing at home this week at the IMG Academy while being filmed for a feature on Trans World Sport, defeated Diae El Jardi of Morocco 6-3, 6-1 Monday afternoon, while Carle took out wild card Carolyn Campana 6-1, 6-0. Those two were the only Top 8 seeds to advance to Wednesday's second round, with eight others falling in first round play. Four girls seeds, who drew qualifiers, will play their first round matches on Tuesday. No. 4 seed Yuki Naito of Japan was the highest seed to fall, with the 16-year-old losing to Sada Nahimana of Burundi 6-4, 1-6, 6-2. Peyton Stearns took out No. 6 seed Nika Radisic of Slovenia 6-3, 6-2 on the Academy Park courts, while No. 7 seed Natasha Subhash lost to Russia's Avelina Sayfetdinova 6-1, 7-5. No. 12 seed Ellie Douglas and No. 14 seed Hurricane Tyra Black were beaten in straight sets by Oona Orpana of Finland and Andreea Prisacariu of Romania, respectively. IMG Academy student Katya Townsend, who has recently committed to Texas A&M, took out No. 15 seed Layne Sleeth of Canada 7-5, 6-2 and Clara Burel of France beat No. 13 seed Ania Hertel of Poland 6-4, 6-4. Margaryta Bilokin of Ukraine, who also trains at the IMG Academy, ousted No. 11 seed Nicole Mossmer 7-5, 6-4, giving the fans surrounding the stadium court a lesson in turning around a set, not once but twice. The 16-year-old right-hander trailed 4-1 in the first set and 4-0 in the second set, yet she figured out what she had to change. "I was rushing and making a lot of mistakes," said Bilokin, who has recently verbally committed to Duke for 2019. "I was just not playing smart. I kind of adjusted to the way she was playing and was more patient with my game. She's a great player, she makes a lot of balls. She's very consistent and doesn't rush. She just forces her opponents to miss and rush, which I was doing. But I got back to my game." The other two girls seeds advancing were No. 9 Joanna Garland of Taiwan and No. 10 Hailey Baptiste. Boys top seed Timofey Skatov of Russia had no difficulty in his first junior match on clay since winning the European 16s championship in July, beating Ryan Goetz 6-1, 6-1. No. 2 seed Uising Park of Korea had a much more challenging first round, coming from behind to defeat Axel Nefve 2-6, 6-4, 6-4. Park was up a break, serving at 4-3 in the third set, only to lose his serve, giving Nefve a chance to take the lead. But Nefve lost his serve to give Park the opportunity to serve out the match, and Park took advantage of Nefve's errors to close it out on his first match point. Thirteen boys seeds played on Monday, with the other three scheduled to play their first round matches against qualifiers on Tuesday. Two of those qualifiers were decided early on Monday, with Sebastian Rodriguez of Peru defeating Noah Schachter 6-4, 2-6, 7-5 in a match carried over from Monday, and Cezar Cretu of Romania beating Boris Kozlov 4-6, 6-4, 6-3. Rodriguez was to be the top seed in the Boys 16s draw, but obviously could not play both divisions, so he was replaced in the 16s draw with a lucky loser. The only two boys seeds to lose Monday were No. 8 Tomas Machac of the Czech Republic, who lost to Jack Draper of Great Britain 6-4, 6-2, and No. 11 Hugo Gaston of France, who was beaten by Nick Hardt of the Dominican Republic 6-2, 6-1. 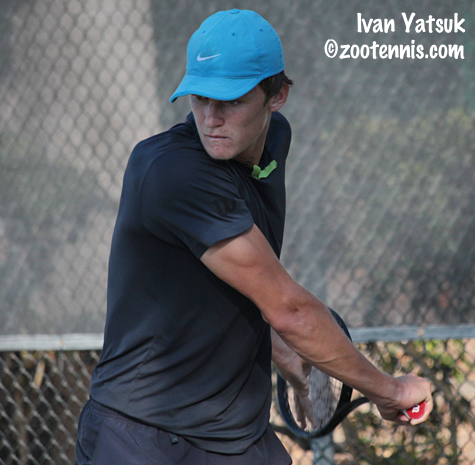 Two of the young IMG Academy wild cards, Toby Kodat and Martin Damm, both 14, won their first round matches. Kodat defeated Otto Virtanen 7-6(3), 6-3 and Damm beat Sheil Kotecha of Kenya 7-5, 6-4. Kodat is playing in his first Grade 1 event, while Damm won his first Grade 1 match in his first Grade 1 tournament last month in Tulsa. The doubles draws have been released, with all first round doubles matches scheduled for Tuesday, after the completion of the remaining 16 first round singles matches. Nicolas Mejia and Uisung Park are the top seeds in the boys doubles, with Whitney Osuigwe and Caty McNally the No. 1 seeds in the girls draw. The ITF order of play for Tuesday is here. In the 12s and 14s divisions, all of the Top 4 seeds advanced; in the girls 16s, No. 2 seed Natasha Sengphrachanh of Canada was beaten by Hibah Shaikh 6-2, 6-4. Many boys 16s first round singles matches were still on court as of 8:30 p.m. The ITF announced several major Junior Circuit rule changes, including coaching at all junior slams, playing lets on serves and points restructuring. The points restructuring will feature both a shadow ranking and a current ranking until April, after the Easter Bowl, when the shadow ranking will take over as the actual ranking. I'm not sure what prompted these rankings changes, but I'll see if I can find out in the next several weeks. Beautiful weather was on tap again Sunday for the two rounds of qualifying at the ITF Grade 1 Eddie Herr, but two boys matches did not finish before dark, and without lights on the 15 Har-Tru courts at the IMG Academy, those will be completed on Monday. No. 14 seed Boris Kozlov and No. 3 seed Cezar Cretu of Romania did not even start their final round qualifying match, with Kozlov not finishing his first match of the day, a 6-7(5), 6-4, 6-4 win over Nicolas Prieto of Colombia until after 3 p.m. Only two matches were completed all day in over seven hours of play on Court 7, with Ziva Falkner of Slovenia beating No. 15 seed Jenna Dean 4-6, 6-2, 7-6(2) in the 8 a.m. match. Noah Schachter also had a marathon day, with his first match of the day against No. 7 seed Vikash Singh of India going nearly three hours despite Singh retiring at 1-1 in the third set. Schachter's second match of the day against No. 12 seed Sebastian Rodriguez of Peru was in the third set when it was suspended due to darkness. Rodriguez is the top seed in the boys 16s, and is scheduled to play his match in that draw at 4:30 on Monday. Michael Heller and wild card Patrick Maloney are the American boys who have reached the main draw via qualifying, while six US girls advanced: Abigail Forbes, Jennifer Gadalov, Chloe Beck, Kacie Harvey, Victoria Hu and Lauren Stein. All six won two matches on Sunday, with Forbes beating top seed Andreea Velcea of Romania 6-3, 6-2 in the final round of qualifying. Monday's order of play for the ITF tournament is here. Qualifying for the 12s, 14s and 16s was completed today and first round matches in all divisions will be played on Monday. Below are the top 8 seeds in each division; see the TennisLink site for complete draws. The ITF Grade 1 Yucatan Cup finished late Saturday night, with No. 6 seed Juan Cerundolo of Argentina beating top seed Chun Hsin Tseng of Taiwan 6-4, 6-3 for the boys title. Earlier Saturday night, Alexa Noel ran her ITF junior winning streak to 12 with a 6-4, 6-2 win over Himari Sato of Japan in the girls final. Noel and her partner, Avelina Sayfetdinova of Russia, lost in the girls doubles final to No. 8 seeds Dalayna Hewitt and Peyton Stearns 7-5, 6-4. Hewitt and Stearns are also on an impressive winning streak with both the Grade A Abierto Juvenil and Yucatan titles this month. Stearns also won the Grade B1 Pan American Closed with Nicole Mossmer last month. The final of the $25,000 Futures in Columbus Ohio was an all-British affair, with No. 5 seed Alexander Ward defeating No. 8 seed Luke Bambridge 6-4, 6-4. Top seeds Hans Hach of Mexico and Luis Martinez of Venezuela won the doubles title, beating No. 2 seeds Bambridge and Ed Corrie of Great Britain 3-6, 7-6(2), 10-7 in the final. This coming week's USTA Futures is a $25,000 tournament in Waco Texas. Part Two of my article on the ATP's Next Gen experiments went up today at the Tennis Recruiting Network, including comments from six pro players at Champaign Challenger, along with Illinois head coach Brad Dancer and USTA stream commentator Mike Cation. This article focuses on the playing let serves, a reduction in medical timeouts, coaching and fan movement. These topics produced a wide variation in responses, more so than those that were addressed in Friday's article. Tonight in Mexico, 15-year-old Alexa Noel won her second consecutive major ITF junior tournament, beating No. 15 seed Himari Sato of Japan 6-4, 6-2 at the Grade 1 Yucatan Cup. The unseeded Noel, who won last week's Grade A in Mexico City, has lost only one set in her 12 wins the past two weeks, in this week's second round against Diane Parry of France. Noel got off to a slow start tonight, dropping her serve to start the match and struggling on serve the next couple of games, but she got the break back, then broke Sato, also 15 years old, serving at 4-5. In the second set, the first five games went to the server, but Nato was broken at 2-3 and then at 2-5 to give Noel the title. As I mentioned in yesterday's post, Noel has withdrawn from the Eddie Herr. In the boys doubles final, No. 8 seeds William Woodall and Andrew Fenty lost to No. 4 seeds Daniel Michalski of Poland and Stefan Palosi of Romania 7-6(0), 1-6, 12-10. The boys singles final and the girls doubles final, the latter of which Noel is participating in, are being played later tonight. At the ITF Grade 5 in the Bahamas, Andrew Dale won his third singles title of the fall, with the No. 2 seed beating top seed Alexander Kiefer 6-3, 4-6, 6-2 in the all-USA final. Dale and Kiefer, the top seeds, teamed up for the doubles title, beating No. 2 seed Joshua Lapadat and Ilya Tiraspolsky of Canada 6-4, 7-5. Top seeds Imani Graham and Madison Kim won the girls doubles title, beating Yao Chen of China and Kristina Tiraspolsky of Canada 7-5, 6-0. Kennedy Bridgforth lost in the girls singles final to unseeded Dagmar Zdrubecka of the Czech Republic 6-2 6-4. Fourteen-year-old Nataly Kader has played only three ITF events, all this fall, but she has now captured a title, winning the Grade 5 in Guatemala. The unseeded Kader beat No. 1 seed Gabriela Giraldo of Colombia 7-5, 6-4 in the final. 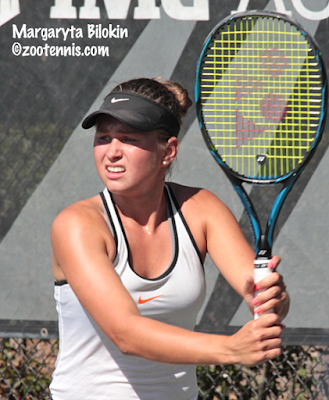 The first round of qualifying was played today at the ITF Grade 1 Eddie Herr in Bradenton Florida, with most of the seeds advancing to Sunday's play, which includes two rounds. The only seeded girl to lose in the opening round was No. 7 seed Chloe Hamlin, who lost to Jada Bui of Canada 6-2, 6-4. In the boys qualifying, three seeds lost, No. 2 seed Nathan Han, No. 4 seed Brandon Perez of Venezuela and No. 6 seed Kirac Bekisoglu of Turkey. Yeudy Villar of the Dominican Republic beat Han 6-3, 7-6(5); Michael Heller defeated Perez 7-5, 6-3 and Ivan Yatsuk downed Bekisoglu 7-5, 6-7(8), 6-2. Heller has advanced to the final round of qualifying via an odd series of events. Brandon Nakashima is not going to use the wild card he was given, so that went to Zicheng Zeng of China, who was in the qualifying draw. Tournament officials thought they had an alternate, but he didn't show up, nor did Zeng's original opponent, so the match was a double walkover, giving no one for Heller to play in the second round. The final eight matches in the 12s, 14s and 16s divisions will all be played on Sunday morning, with the eight winners advancing to the main draw, which begins Monday. The complete draws are at the TennisLink site. The Next Gen experiments, and recently, the Grand Slam committee's recent announcement of changes have been a hot topic in the tennis world, so when I was at the Champaign Challenger last week I spoke to a half dozen pros and other tournament officials to get their thoughts on the experiments held during the 21-and-under tournament the ATP held for the first time earlier this month. In the first of a two-part series for the Tennis Recruiting Network, I sought their opinions on the all-electronic line calling, the 25-second serve clock, the four-game best-of-five sets and no-ad scoring. In Friday's second part, the discussion turns to playing lets on serves, allowing coaching and fan movement, and reducing the number of medical timeouts. 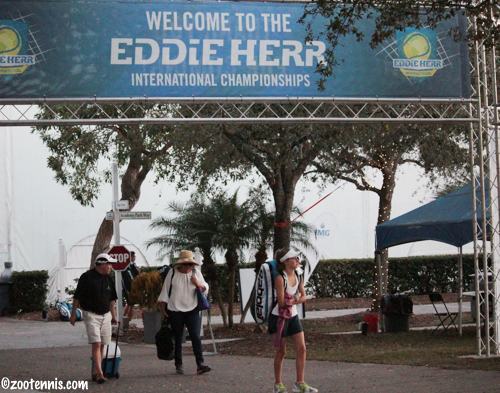 The qualifying draws have been released for the ITF Grade 1 Eddie Herr, which begins at 8 a.m. on Saturday morning. Both boys and girls draws are full this year, but only two wild cards were needed to fill the girls draw. Twenty US boys are in the 64-player qualifying draw, with five of them seeded: Jaycer Lyeons, Nathan Han, Sumit Sarkar, Boris Kozlov and Pierce Rollins. Twenty-three US girls are competing for a place in the main draw, with nine of them seeded: Kianah Motosono, Chloe Beck, Kacie Harvey, Chloe Hamlin, Victoria Hu, Lauren Stein, Abigail Forbes, Jenna Dean, and Jennifer Gadalov. The order of play for Saturday's ITF qualifying matches is here. Rain this week has put the qualifying for the 12s, 14s, and 16s behind schedule, and with four matches needed to determine the eight qualifiers, girls 16s will double up on Saturday, playing two rounds. The weather forecast is good, with just a small chance of precipitation for the weekend and the week of the main draw. At the ITF Grade 1 Yucatan Cup, Alexa Noel has reached the final after defeating No. 12 seed Sada Nahimana of Burundi 6-0, 6-1. The 15-year-old had beaten top seed Maria Carle of Argentina 6-4, 6-3 on Thursday, and has now run her winning streak in Mexico to 11. Understandably, Noel has withdrawn from the Eddie Herr, as has Andrew Fenty, who lost today in the Yucatan semifinals. Fenty, the No. 2 seed, lost to No. 6 seed Juan Cerundolo of Argentina 6-1, 4-6, 6-1 in singles, but he and William Woodall have advanced to the doubles final, a result that puts Woodall into the main draw at the Eddie Herr. I will be taking Thanksgiving Day off, but I do want to take the opportunity today to thank all of my readers, supporters and sponsors. I am grateful to all who have contributed to this website whether by reading, commenting, donating or supporting my advertisers, and I hope to continue to be able to cover junior and college tennis for many years to come. The new USTA Level 1 gold ball National Indoor Championships begin this Friday at locations across the country. Links to the TennisLink pages for each division are in the heading below. Because I am covering the Eddie Herr, I won't have the opportunity to follow these closely, but I will post the champions in the Honor Roll section to the left. Several of the wild cards for the ITF Eddie Herr Grade 1 have been awarded. There will be others in the next few days. The first two rounds of the ITF Grade 1 Yucatan Cup are complete, with many Top 8 girls seeds ousted. No. 2 seed Lulu Sun of Switzerland lost in the first round to Andreea Prisacariu of Romania, who was then beaten by Ana Geller, Axel's sister, in the second round. Americans Vanessa Ong, qualifier Alexandra Yepifanova, Gabby Price and Peyton Stearns all took out Top 8 seeds. Top seed Maria Carle of Argentina is through to the round of 16, as is Grade A Abierto Juvenil champion Alexa Noel. Boys top seed Chun Hsin Tseng of Taiwan and No. 2 seed Andrew Fenty have advanced. Drew Baird withdrew from this week's event after winning the Abierto Juvenil last week in Mexico City. US Open girls champion Amanda Anisimova defeated No. 2 seed Su-Wei Hsieh of Taiwan 6-0, 6-1 today to advance to the second round of the $125,000 WTA tournament in Honolulu Hawaii. Allie Kiick, Julia Boserup, Danielle Lao, Jacqueline Cako and Sachia Vickery have also advanced to the second round. Vickery defeated Danielle Collins 6-4, 7-6(2) avenging her loss in Sunday's final at the $25,000 tournament in Norman Oklahoma. The $25,000 Columbus Futures is unsurprisingly filled with Ohio State Buckeyes, with two of them facing off in the second round on Wednesday. Senior Mikael Torpegaard, who beat No. 4 seed Ed Corrie 6-4, 6-2 today, will play freshman John McNally, who defeated Illinois sophomore Noe Khlif 7-5, 6-2. Sophomore JJ Wolf was the third current Ohio State player to advance, beating Nico Mostardi 6-2, 6-2, while former Buckeye Hunter Callahan also picked up a first round win. Top seeds Christian Harrison and Alex Sarkissian posted straight-sets wins in their first round matches. Qualifying for the 12s, 14s and 16s divisions at the Eddie Herr International begins Wednesday at the IMG Academy in Bradenton Florida. Draws can be found at Tennis Link. Announcements of changes coming to the Grand Slams were released today, with a serve clock of 25 seconds being used this year at the Australian Open, and beginning in 2019, the seeds being reduced from 32 to 16. The problem of less than healthy players retiring in the first round just to claim the prize money has been addressed, with a 50% split to a lucky loser and a player who withdraws at the last minute. 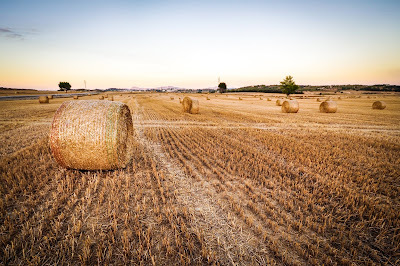 For more on these changes, see this article. On Thursday, look for the first of a two-part article I wrote for the Tennis Recruiting Network about how several players I spoke to at the Champaign Challenger feel about many of the recent trials and experiments that have been tested. Not be left out, the ITF Junior Circuit has joined the no-let experiment, according to a recent message from the ITF as shown in the tweet below. I don't have any more information about that now, but I will try to find out more while I'm in Florida covering the two big ITF events there. The ITF Junior Circuit will implement a 'no-let service' trial for all events in the 2018 season. The USTA announced its six 2018 College Match Days beginning in February at the National Campus in Lake Nona Florida. For more on these free events at the stunning new facility outside Orlando, see this article at usta.com. The early signing announcements are starting to wind down, so this will be my last update. See my previous compilations from November 8. November 10 and November 13. Auburn has signed Matteo De Vincentis of Italy. BYU has signed Kobe Tran. Central Florida has signed Trey Hilderbrand. Georgia has signed Britton Johnston and Blake Croyder. Georgia Tech has signed Joseph Gandolfo. Medhi Laale of Morocco is transferring from Division II Lynn to Louisville. Miami has signed Franco Aubone of Argentina, Francisco Bastias of Argentina and Kaya Gore of Turkey. Mississippi has signed Sebastian Rios. Oklahoma State has signed Matej Vocel of the Czech Republic. Dylan Bednarczyk of Canada has transferred from Nebraska. San Diego has signed Noah Dufort. South Carolina has signed Joseph Brailovsky, Nick Watson, Jacob Beasley and Patrick Cacciatore. Tennessee has signed Sean Presson. Virginia has signed Ryan Goetz, William Woodall and Gianni Ross. Ross will start in January of 2018. Washington has signed Kasper Smith. Western Michigan has signed Nicholas Hebda, Peter Kuszynski of Canada and Jack Randall. Wisconsin has signed Daniel Nuzhny, Jared Pratt and Lenard Soha of Germany. Alabama has signed Kimika Sakata of Japan. Central Florida has signed Domenika Turkovic of Croatia. Kansas has signed Julia Deming. Kentucky has added Tiphanie Fiquet of France to its previous signing announcement. Memphis has signed Leonarda Janko of Croatia, Hannah Davies of Hannah Davies of Great Britain and Aleksandra Topalovic of Great Britain. North Carolina State has signed Alana Smith. Ohio State has signed Kolie Allen, Emma DeCoste and Isabelle Boulais of Canada. Tennessee has signed Kylie Duckworth. Utah has signed Anya Lamoreaux, Lindsay Hung, Emily Dush and Madison Tattini. 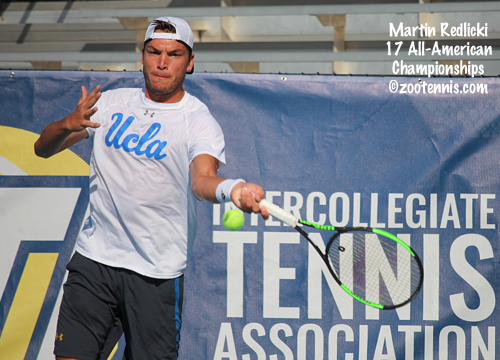 The ITA released the final fall rankings last week, with Martin Redlicki of UCLA and Anastasia Rychagova of Kansas in the top spot. Click on the headers for the complete lists. Yesterday unseeded Alexa Noel upset No. 1 seed Whitney Osuigwe to earn the girls singles trophy at the ITF Grade A Abierto Juvenil in Mexico City. Today, unseeded Drew Baird pulled off a similar surprise, beating top seed Sebastian Korda 76(4), 3-6, 6-0. The 17-year-old Baird, playing in his first Grade A event, got the first break of the final at 4-3, but Korda got the break right back. After four holds, the tiebreaker was similarly close, with Korda twice taking a mini-break lead. But leading 4-3, Korda began to spray balls, especially on his backhand side, and Baird won the final four points of the set, closing it out with a good serve on his first set. Korda fought back in the second set, coming forward more often, but after nearly and hour and a half of play, the 17-year-old began to show signs of an injury and quickly went down two breaks, 3-0, in the third set. After a lengthy off-court medical timeout, Korda returned, but Baird did not let the injury affect him, efficiently finishing off his IMG Academy training partner. Neither Osuigwe nor Korda are playing next week's Grade 1 Yucatan Cup, but both Baird and Noel are in the singles draws, with both unseeded. There are 22 US boys and 21 US girls in the 64-player draws. Maria Carle of Argentina is the top seed in the girls draw and Chun Hsin Tseng of Taiwan is the top seed in the boys draw. Two-time NCAA champion Danielle Collins won her second $25,000 USTA Pro Circuit title of 2017 today in Norman Oklahoma. The University of Virginia graduate, seeded No. 3, defeated No. 2 seed Sachia Vickery 1-6, 6-3, 6-4. Collins, who has reached five finals on the USTA Pro Circuit this year, is playing in the WTA $125K event this coming week in Hawaii, as is Vickery. Stanford freshman Michaela Gordon has received a wild card. The complete player list is here. Former USC star Emilio Gomez of Ecuador won the $15,000 Futures title in Pensacola Florida, with the No. 3 seed defeating No. 5 seed Ulises Blanch 3-6, 7-5, 6-1. It's Gomez's first Futures title since 2015. Top seeds Hunter and Yates Johnson(SMU) won their fifth title as a team and second this year, beating No. 2 seeds Junior Ore and Harrison Adams(Texas A&M) 6-3, 6-3. All the action for US juniors wasn't just in Mexico, with four Americans winning ITF Grade 4 and 5 singles titles. At the Grade 4 in the Philippines, 16-year-old Nicole Hammond won her first ITF junior singles title, beating Elizabeth Stevens 6-1, 6-4 in the all-USA final. Neither was seeded. Hammond and Stevens won the doubles title too, with the unseeded pair defeating Jingyi Li and Fangran Tian of China 6-3 6-4 in the final. At the Grade 5 in El Salvador, No. 2 seed Midori Castillo Meza beat top seed Kennedy Bridgforth 7-5, 1-6, 7-5 in another all-USA final. The 14-year-old Castillo Meza won Grade 5 in Costa Rica last week. Jackson Ross teamed with Alfredo Casso of Mexico to take the boys doubles title. Fifteen-year-old Spencer Brachman, who just began competing on the ITF Junior Circuit this fall, won his first titles at the Grade 5 in Antigua. The unseeded Brachman defeated top seed Jeffrey Fradkin 6-3, 6-2 in yet another all-USA singles final, then paired with Fradkin to take the doubles title as well. The unseeded Brachman and Fradkin beat Canada's Christopher Heck of Canada and Tom LeBlanc Claverie, the No. 2 seed, 7-6(0), 6-3 in the final. Fifteen-year-old Hibah Shaikh won the girls singles title in her ITF Junior Circuit debut, beating top seed Alexandra Anttila of Finland 6-3, 6-1 in the final. The two singles finalists then paired up for the doubles title, defeating No. 1 seeds Sydney Clarke of the Bahamas and Tangia Riley-Codrington of Barbados 6-0, 6-3 in the final. Unseeded 15-year-old Alexa Noel had a breakout tournament this week at the ITF Grade A Abierto Juvenil in Mexico City and she topped it off with a 6-2, 6-4 win over the ITF World No. 1 junior Whitney Osuigwe in today's all-American girls singles final. Noel, who had not played a tournament since July, didn't drop a set in any of her six victories, and her variety-laden game proved too much for Osuigwe today. Noel was serving particularly well, and when things got tight late in the second set, her first serve and her willingness to use her lethal drop shot against the speedy Osuigwe proved the difference. Noel couldn't consolidate the break she earned for a 4-3 lead, but she broke Osuigwe in a four-deuce game to take a 5-4 lead and served out the match for her first ITF title above the Grade 4 level. Noel, who won the Junior Orange Bowl 14s last year, had lost to Osuigwe in the Easter Bowl 14s final in 2015. Things didn't get any better for Osuigwe after the singles final, when she and Ellie Douglas, the top seeds, lost in the doubles final to unseeded Peyton Stearns and Dalayna Hewitt 6-4, 6-3. Like Noel, unseeded Drew Baird is having the tournament of his ITF junior career, reaching Sunday's boys singles final despite his ranking of 192. Baird, a 17-year-old who is playing in his first Grade A, has won two Grade 4 titles this year but has struggled to post wins at the Grade 1 level. After dropping a set in his first match, Baird has advanced to the final without losing another, and in today's semifinal against Filip Jianu of Romania, Baird posted a 7-6(2), 7-6(1) victory. He will face top seed Sebastian Korda, who had his toughest match of the week by far against No. 5 seed Thiago Tirante of Argentina, coming back for a 4-6, 7-6(3), 6-3 victory. The boys final will be streamed live, but without commentary, at the tournament's website. Tristan Boyer is now on a 15-match winning streak at the Grade 2 level, after claiming his second straight ITF singles title in Israel. The 16-year-old Californian, who won a Grade 2 in Japan last month after reaching the semifinals of the Grade A in Osaka, was the top seed this week, and as was the case last week, he beat No. 2 seed Yanki Erel of Turkey in the final. After a straight-sets loss last week, Erel did win a set today, but Boyer prevailed 6-3, 6-7(5), 6-1. Already in the Top 50, Boyer will move into the Top 40 with this week's title. Fifteen-year-old Canadian Leylah Fernandez won the girls singles title, after she also won the title in the Grade 2 the previous week. At the Grade 3 in Bolivia, 17-year-old Chloe Hamlin won her first ITF singles title. The No. 6 seed defeated top seed Maria Rivera Corado of Guatemala 7-6(5), 0-6, 7-5 in the final. Jenna Dean reached the final of the girls doubles. The USTA Pro Circuit Challenger season came to a close today at the $75,000 tournament in Champaign, with No. 7 seed Tim Smyczek winning the title with a 6-2, 6-4 victory over No. 5 seed Bjorn Fratangelo. Fratangelo struggled with a back injury throughout the match, so another comeback victory for him wasn't in the cards. The title is the second for Smyczek in the past three weeks, and he will move to around 130 in the ATP rankings with his recent run. Top seeds Leander Paes and Purav Raja of India won the doubles title, beating No. 3 seeds Ruan Roelofse(Illinois) of South Africa and Joe Salisbury(Memphis) of Great Britain 6-3, 6-7(5), 10-5. The final is set at the $25,000 Women's Pro Circuit event in Norman Oklahoma, with No. 3 seed Danielle Collins facing No. 2 seed Sachia Vickery. Collins ousted top seed Sonya Kenin 6-1, 6-2, while Vickery needed just short of three hours to beat unseeded Maria Sanchez 5-7, 6-3, 7-5. Collins won their last meeting two weeks ago in the first round of the $80K in Tyler; Vickery won their previous two meetings last year. Chiara Scholl and Belgium's Tammy Hendler, who had to qualify into the doubles draw, won the title, beating top seeds Sanchez(USC) and Caitlin Whoriskey(Tennessee) 3-6, 6-3, 10-6. At the $15,000 Futures in Pensacola Florida, 19-year-old Ulises Blanch will face former USC star Emilio Gomez of Ecuador in Sunday's final. The fifth-seeded Blanch defeated No. 6 seed Roberto Cid of the Dominican Republic 3-6, 6-3, 6-3 to reach his second career Futures final. The 25-year-old Gomez took out Mississippi State junior Nuno Borges of Portugal, the No. 4 seed, 7-6(5), 7-5. He is looking for his first Futures title since 2015. While I was in Champaign for the $75,000 ATP Challenger earlier this week, I had an opportunity to talk with Ronnie Schneider, the recent University of North Carolina graduate, who is now pursuing a career as a professional. I'm always interested in the transition from college to the Pro Circuit, a transition that was complicated for Schneider by surgery after his junior year that left him without an ATP ranking upon graduation. Now inside the Top 600, Schneider will continue playing in Futures the next month, and in our conversation, posted today at the Tennis Recruiting Network, he explains why he's not interested in an off-season right now. The finals are set in Champaign, with Americans Tim Smyczek and Bjorn Fratangelo advancing via three-set wins today. No. 7 seed Smyczek defeated No. 4 seed Cameron Norrie of Great Britain 7-5, 6-7(5), 6-3 and No. 5 seed Fratangelo beat No. 3 seed Taylor Fritz 3-6, 6-3, 6-2, winning seven straight games from 3-all in the second set. 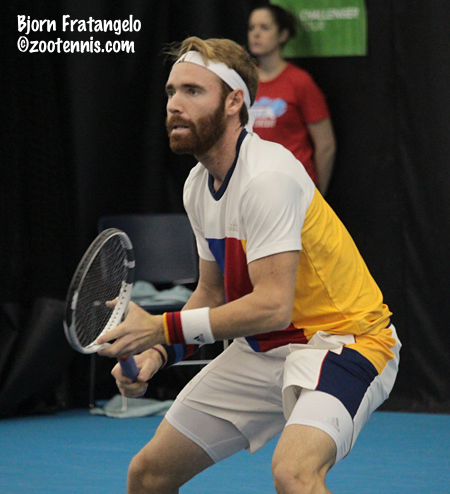 Smyczek clinched the USTA's Australian Open wild card yesterday; Fratangelo would move into the Top 100 with a win tomorrow, which would assure him a place in the main draw. At the $25,000 USTA Women's Pro Circuit event in Norman Oklahoma, all four semifinalists are Americans: the top three seeds and unseeded Maria Sanchez. Top seed Sonya Kenin avenged her May loss to Claire Liu, taking out the Wimbledon girls champion 7-6(6), 7-5 in two hours and 22 minutes. Kenin will play No. 3 seed Danielle Collins next, with Collins defeating No. 5 seed Ulrike Eikeri of Norway 7-6(2), 6-2 in another two-hour-plus contest. Collins beat Kenin 6-1, 7-6(10) two weeks ago in the semifinals of the $80,000 tournament in Tyler. Sanchez, who beat No. 7 seed Michaela Honcova of Slovakia6-2, 6-4, will face No. 2 seed Sachia Vickery, who defeated Chiara Scholl 1-6, 7-6(4), 6-2. At the $15,000 Futures in Pensacola Florida, Ulises Blanch is the only American to advance to the semifinals. The 19-year-old, seeded fifth, will face No. 6 seed Roberto Cid, the former South Florida star from the Dominican Republic next. Cid ended the impressive run of 16-year-old wild card Will Grant with a 2-6, 6-1, 6-2 victory. Mississippi State junior Nuno Borges of Portugal, the No. 4 seed, will face former USC standout Emilio Gomez of Ecuador, the No. 7 seed, in the other semifinal. The girls singles and both doubles finals will be played on Saturday at the ITF Grade A Abierto Juvenil in Mexico City, with an American guaranteed to win all three titles. Fifteen-year-olds Whitney Osuigwe, the top seed, and unseeded Alexa Noel will face off for the girls singles title, the second year in a row that the girls championship match has been between Americans, with Taylor Johnson defeating Ellie Douglas in last year's final. Osuigwe defeated No. 5 seed Lulu Sun of Switzerland 6-1, 7-5 and Noel beat unseeded Andreea Prisacariu of Romania 7-5, 7-5, Noel's fifth consecutive straight-sets win. Osuigwe and Noel met in the 2015 Easter Bowl 14s championship match, with Osuigwe managing to post a 4-6, 6-0, 7-6(4) victory. Osuigwe will also play in an all-American doubles final. Osuigwe and Douglas, the top seeds, will face unseeded Dalayna Hewitt and Peyton Stearns. The boys doubles final will feature No. 7 seeds Andrew Fenty and William Woodall against top seeds Sebastian Korda and Colombia's Nicolas Mejia. Korda, also the top seed in boys singles, has advanced to the semifinals, where he will take on No. 5 seed Thiago Tirante of Argentina. Unseeded Drew Baird continued his impressive run, beating No. 9 seed Nick Hardt of the Dominican Republic 6-3, 6-3. He will face No. 13 seed Filip Jianu of Romania next. Tim Smyczek earned his way into the Australian Open main draw today at the $75,000 Champaign Challenger, defeating top seed Tennys Sandgren 6-4, 6-4. Smyczek, the No. 7 seed, won the Charlottesville Challenger two weeks ago to take the lead in the USTA's Australian Open Wild Card Challenge and once he advanced to the semifinals this week, no one else still playing in Champaign could catch him. The 29-year-old from Wisconsin had played the main draw in Australia four years running from 2013-2016, but this year he lost in the final round of qualifying to Frances Tiafoe. In the Champaign semifinals, Smyczek will play No. 4 seed Cameron Norrie, who beat Mackenzie McDonald 6-2, 6-0. No. 5 seed Bjorn Fratangelo, who was eliminated from the wild card race today, could still qualify for the main draw of the Australian Open if he wins the tournament. For the second time this week, Fratangelo was on the brink of defeat, but recovered, beating Knoxville champion Filip Peliwo of Canada 4-6, 7-5, 7-6(4). Today Fratangelo trailed 4-6, 2-4 0-40, although he was not quite as far down as he was in the first round against Sebastian Fanselow, when he trailed by a set and two breaks before winning in three. Fratangelo will face No. 3 seed Taylor Fritz, who reached the semifinals with a 6-1, 3-0 retired victory over No. 8 seed Tommy Paul. Paul had treatment for a back problem and retired after Fritz earned a second break of serve. At the $25,000 Women's Pro Circuit event in Norman Oklahoma, Wimbledon girls champion Claire Liu, who has not played since September, has reached the quarterfinals, where she'll face top seed Sonya Kenin. Liu defeated Connie Hsu of Taiwan 6-1, 6-4, while Kenin dismissed Francesca Di Lorenzo 6-2, 6-3. Liu and Kenin have played four times on the ITF Circuits, with Kenin winning the two junior matches and Liu winning the two pro matches, with the most recent win coming this spring at a $25,000 tournament in Florida. Other US players to advance to the quarterfinals are Danielle Collins, Maria Sanchez, Chiara Scholl and Sachia Vickery. The Futures event this week is again a $15,000 tournament, this time in Pensacola Florida. 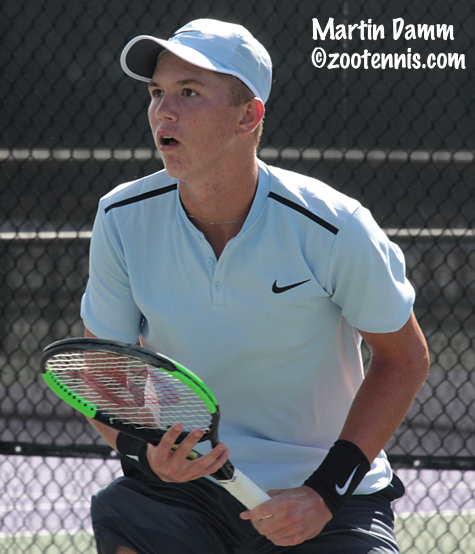 Sixteen-year-old Will Grant earned his first ATP point with a win over fellow wild card Collin Johns in a first round match on Tuesday, then got two more points today via a victory over top seed Sekou Bangoura. Bangoura retired in the match trailing 7-5, 2-1. Other Americans reaching the quarterfinals are wild card Jonathan Chang and No. 5 seed Ulises Blanch. Florida freshman Duarte Vale of Portugal, a qualifier, beat No. 2 seed Fabrizio Ornago of Italy 6-7(5), 7-5, 6-0. ITA Fall National champion Nuno Borges of Mississippi State, the No. 4 seed, has also advanced to the quarterfinals, beating last week's Futures champion Patrick Kypson 6-4, 6-2 today. At the ATP World Tour Finals in London today, Jack Sock, the No. 8 seed, defeated No. 3 seed Alexander Zverev of Germany 6-4, 1-6, 6-4 to advance out of his round robin group and into the semifinals, where he'll play No. 6 seed Grigor Dimitrov of Bulgaria. The other semifinal will feature top seed Roger Federer and the winner of the Dominic Thiem-David Goffin match on Friday. For more on Sock's win today, see the ATP website's article. The girls semifinals are set at the ITF Grade A Abierto Juvenil in Mexico City, with Americans Whitney Osuigwe and Alexa Noel into the final four. Top seed Osuigwe had to come from behind to beat unseeded Peyton Stearns, but posted a 4-6, 6-2, 6-4 victory and will face No. 5 seed Lulu Sun of Switzerland. The unseeded Noel, who like Osuigwe is 15 years old, has yet to lose a set this week, beating Diae El Jardi of Morocco 6-4, 6-4 in today's quarterfinal. Noel will face another surprise semifinalist in 17-year-old Andreea Prisacariu of Romania, who beat No. 8 seed Nicole Mossmer 6-0, 6-2. Two American boys have advanced to the quarterfinals in Mexico City, top seed Sebastian Korda and unseeded Drew Baird. Korda defeated wild card Eliot Spizzirri 6-2, 6-0 in today's third round and will play No. 8 seed Stefan Palosi of Romania, who beat qualifier Jaycer Lyeons 6-2, 6-2. Baird downed wild card Alan Magadan of Mexico 6-2, 6-3 and will face No. 9 seed Nick Hardt of the Dominican Republic in the quarterfinals. The girls quarterfinals are set at the ITF Grade A Abierto Juvenil in Mexico City, with four US girls still in the running for the title. Top seed Whitney Osuigwe defeated No. 13 seed Diane Parry of France 6-1, 6-2 to advance to a meeting with unseeded Peyton Stearns. Stearns defeated doubles partner Dalayna Hewitt 6-7(4), 6-4, 6-3 to reach her first Grade A quarterfinal. Natasha Subhash, the No. 4 seed, lost to No. 15 seed Sada Nahimana of Burundi 7-5, 6-4. The two US girls in the bottom half of the draw do not play each other, with unseeded Alexa Noel facing unseeded Diae El Jardi of Morocco and No. 8 seed Nicole Mossmer playing unseeded Andreea Prisacariu of Romania. Prisacariu defeated No. 2 seed Maria Carle of Argentina, who had taken a wild card into the tournament, 6-3, 7-5 and is known for her prowess on clay. Mossmer also reached the quarterfinals in Mexico City last year before falling to Amanda Anisimova. Fifteen-year-old Noel, who has not played a tournament since July's USTA Clay Courts, will be playing in her first Grade A quarterfinal. She advanced with a 6-2, 6-0 win over 2016 finalist Ellie Douglas, the No. 3 seed. The boys are a round behind, with the round of 16 matchups now set. Six US boys have advanced, but five of them are in the top half. Top seed Sebastian Korda will face wild card Eliot Spizzirri in the only all-American contest. Qualifier Jaycer Lyeons defeated No. 12 seed Leonid Sheyngezikht of Bulgaria 7-6(10), 6-2. No. 16 seed Axel Nefve and No. 10 seed Sangeet Sridhar moved into the third round with straight-sets wins. The only American boy in the bottom half is unseeded Drew Baird. No. 3 seed Andrew Fenty, who was awarded a wild card into the event, lost to unseeded Justin Schlageter of Germany 6-1, 7-6(3). I've completed my brief trip to the $75,000 ATP Champaign Challenger, where six of the quarterfinalist are Americans. Top seed Tennys Sandgren, who told me he played this week in spite of his ranking of 85 because he has finalist points coming off from last year's Columbus Challenger and wants to make sure he is safe for main draw for the Australian Open. Sandgren has played seven of the last eight weeks, going 17-6 in that span, so getting a walkover from Christian Harrison today, which was announced after the warm-up, was a break for him. He plays No. 7 seed Tim Smyczek, who beat wild card Dennis Nevolo 6-3, 7-6(4). 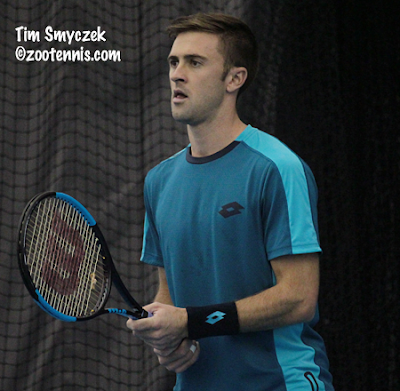 Smyczek is in the driver's seat for the USTA's Australian Open wild card, having won the title in Charlottesville over Sandgren in the final. I believe that if Smyczek wins Thursday, he'll clinch the wild card. If Smyczek doesn't win Thursday, Bjorn Fratangelo still has an opportunity to tie him and Fratangelo wins the tiebreaker, which is ATP ranking. But taking the title, which Fratangelo has to do, would probably boost Fratangelo's ranking high enough so he wouldn't need the wild card. Fratangelo defeated Bradley Klahn 6-4, 6-4 today, getting his second win over the 2010 NCAA singles champion this year. "It's always difficult to play a really good friend," said Fratangelo, the No. 5 seed. "Brad's probably one of my best friends out here, but I know his game well and I match up pretty well with him. I just tried to execute, and I think it was a pretty straightforward match." Fratangelo will face Filip Peliwo of Canada, last week's champion at the Knoxville Challenger, after Peliwo ousted two-time defending champion Henri Laaksonen of Switzerland 6-3, 7-5. No. 3 seed Taylor Fritz and No. 8 seed Tommy Paul will renew their rivalry in the quarterfinals after advancing in opposite fashion. Fritz did not face a break point in his 6-4, 6-3 win over qualifier Ronnie Schneider, while Paul was pushed to the limit by qualifier Mikael Ymer of Sweden before taking a 6-4, 3-6, 7-6(0) decision. Nothing separated Paul, the 2015 French Open boys champion, and Ymer, the 2015 Wimbledon boys finalist, until the final set tiebreaker, and suddenly the errors Ymer avoided down the stretch appeared. Down 3-0, Ymer double faulted and the errors snowballed from there, providing a letdown of an ending to the nearly three-hour contest. Paul's title in Paris came over Fritz, who then returned the favor in the final of the US Open boys championship in 2015. They played in the round of 16 of the Winnetka Challenger this summer, with Paul earning a 7-6(7), 7-5 victory. The fourth quarterfinal will feature Mackenzie McDonald and No. 4 seed Cameron Norrie. 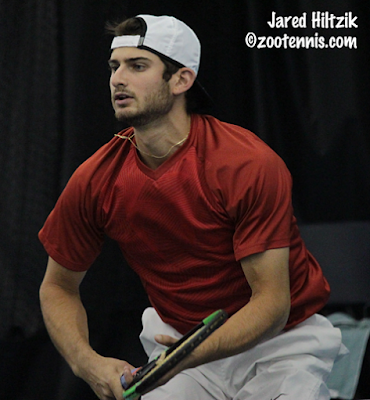 McDonald defeated JP Smith of Australia 7-5, 7-6(5) and Norrie eliminated wild card Jared Hiltzik 6-2, 6-4. Jared Hiltzik fought his way back into his match against Mitchell Krueger Tuesday evening in the first round of the $75,000 ATP Challenger in Champaign, and it was a battle of wills in the final set, with both players getting service hold after service hold. The scores of orange-clad fans cheering the former Illini All-American at the Atkins Tennis Center didn't make much noise when he fell behind 0-40 serving at 5-6 in the third set, however. If that silence bothered Hiltzik, he showed no sign of it, hitting one of his six third-set aces to save the first match point. Hiltzik saved the second match point with a forehand pass and the third and last match point he saved with a backhand pass. After one more deuce Hiltzik forced the tiebreaker and he ran away with that final game to post a 3-6, 6-4, 7-6(2) victory. "I think you play better when you're down," said the 23-year-old from Illinois, who had lost to Krueger in all four of their previous Pro Circuit contests. "You have no other choice than to play free. I got pretty lucky today, but I fought hard." Although he appreciated the efficiency of an ace in that crucial situation, Hiltzik said the two winning passes he made to save the second and third match points were won on instinct. "He doesn't really give you a chance to think," said Hiltzik, who has recently bought a house in Orlando and is now training at the USTA National Campus. "You react, and I got lucky there." In the tiebreaker, Krueger lost the first three points on his serve, all on forehand errors and Hiltzik ran out to a 6-0 lead. "I think that kind of carried over from that previous game," Hiltzik said. "It's a tough thing to do. I've been there, when you have a chance to break to win the match, it's really tough." Hiltzik, who received a wild card into the main draw, said winning a match at his former home courts always feels good. "I've had many here before and to be given the opportunity to continue to play here is pretty special." Hiltzik will face No. 4 seed Cameron Norrie of Great Britain, who defeated another Illinois wild card, senior Aleks Vukic of Australia, 6-2, 6-3. While Hiltzik was playing on Court 2, another former Illinois star who also received a wild card, Dennis Nevolo, was fashioning his own comeback against qualifier Samuel Monette of Canada in his 4-6, 6-4, 6-0 victory. After failing to serve out the second set at 5-3 despite earning a set point, Nevolo broke the former standout at the University of Indiana in the next game to even the match. Once the third set began, Nevolo found his form, while Monette was finding it difficult to move to balls he had easily tracked down before. Nevolo held, broke and held to take a 3-0 lead, and ended the match by winning the final 15 points. Nevolo's second round opponent is No. 7 seed Tim Smyczek, who defeated qualifier Alex Ward of Great Britain 6-4, 7-6(4) in a high-quality match that featured an abundance of lengthy rallies. The day's shortest match was No. 3 seed Taylor Fritz's 6-2, 6-1 win over Alex Sarkissian, which lasted just 42 minutes. The 20-year-old Californian had 11 aces and no double faults, and has been happy with his play over the past few weeks. "I usually play pretty well indoors, I think," said Fritz, who reached the final of the 2015 Champaign Challenger. "The ball moves through the court here and it's easier to serve, hit winners. It's not too fast, it's like medium, so it's easy for me to put the ball away." Fritz is currently at 110 in the rankings, so his performance this week will go a long way to deciding whether he gets into the main draw of the Australian Open, but he is confident now that he's returned to the racquet he had used prior to this year. "I've been playing well over the past two weeks," Fritz said. "Last week I thought I was playing really well; unfortunately I played Peliwo who was way too good last week, to be honest. He was incredible. I played great. I switched back to my old racquet. I was using a heavier racquet all this year. I've always been with Head, and it was the same racquet, just added some weight for this year. I've had an ok year, but it just didn't feel right and after Vietnam [Challenger] I said that's it. I don't think I can control the ball off the ground, it's too heavy and I'm late on my shots. So I switched back, had a training week at Carson and it's been great since. Better than ever." Fritz will play qualifier Ronnie Schneider, who claimed his second ATP Challenger victory, with a 4-6, 6-3, 6-1 decision over Bruno Santanna of Brazil. No. 5 seed Bjorn Fratangelo versus Bradley Klahn and No. 1 seed Tennys Sandgren versus Christian Harrison are the other two all-American second round matches Wednesday. The first round of the ITF Grade A Abierto Juvenil in Mexico City is underway, with Americans at the top of both draws. ITF No. 1 Whitney Osuigwe, who has set a goal of being the 2017 World Junior Champion, took a wild card into the tournament and is, of course, the No. 1 seed. 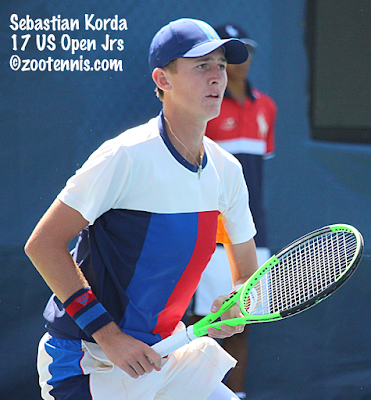 Sebastian Korda, who has not played a junior event since the US Open, is the boys top seed. Both Osuigwe and Korda earned straight-sets wins in their first round matches today. Andrew Fenty also received a wild card into the tournament and is the No. 3 seed. Eliot Spizzirri, who reached the final of the Grade 2 in Bolivia last week, also received a wild card. Other US boys who are seeded: Sangeet Sridhar, Brian Shi and Axel Nefve. US girls who are seeded in addition to Osuigwe: Ellie Douglas, Natasha Subhash, Nicole Mossmer, Elli Mandlik, Lea Ma. In all, there were 23 US boys and 21 US girls in the 64-player singles draws at the start of play today..
Maria Carle of Argentina, the No. 2 seed, also accepted a wild card into the event. Live scoring is available at the Tennis Ticker. The early signing announcements are continuing, with those below in addition to the links I posted on Wednesday and Friday. If no country is given, the player is from the US. Brigham Young has signed Brigham Andrus. Duke has signed Robert Maciag. Florida has signed Sam Riffice and Lukas Greif. Florida State has signed Sebastian Arcila and Jorge Martinez Martinez of Spain. Indiana has signed Carson Haskins and Patrick Fletchall. Iowa has signed Oliver Okonkwo of Great Britain. Louisville has signed Alex Wesbrooks. LSU has signed Boris Kozlov. Michigan has signed Andrew Fenty, Steven Forman, Ryan Fu and Patrick Maloney. Mississippi State has signed Gregor Ramskogler of Austria. North Carolina has signed Brian Cernoch. Oklahoma State has signed Emile Hudd of Great Britain. South Florida has signed Niels Van Noord of Canada, Sergio Gomez-Montesa of Spain and Ivan Yatsuk. Southern California has signed Jake Sands and Bradley Frye. Arizona has signed Csenge Furak of Hungary. Arkansas has signed Thea Rice. Florida has signed McCartney Kessler, who will start in January, and Marlee Zein. Georgia has signed Meg Kowalski. Indiana has signed Somer Henry. Iowa has signed Michelle Bacalla and Samantha Mannix. Kentucky has signed Yang Lee of Taiwan and Alexis Merrill. Diana Tkachenko is transferring in January, after Evansville dropped their women's program this fall. Minnesota has signed Isabella Lambert. Nebraska has signed Jessica Aragon. North Carolina has signed Cameron Morra. North Carolina State has signed Helene Grimm of Germany, who will start in January. Ole Miss has signed Isolde de Jong of the Netherlands. Rice has signed twins Anastasia and Victoria Smirnova of Belgium. Tennessee has signed Kaitlin Staines of Australia. Texas A&M has signed Brindtha Ramasamy of Canada, Jayci Goldsmith and Katya Townsend. Texas Tech has added Denise-Antonella Stoica of Romania to their previously announced recruits Sydney Jones, Nell Miller and Olivia Peet. UCLA has signed Elysia Bolton. Wake Forest has signed Anna Brylin and Peyton Pesavento. Washington has signed Sedona Gallagher. In less happy news in college tennis, former Georgia men's associate head coach Bo Hodge has pleaded guilty to possession of a schedule II controlled substance, a felony. Sentenced as first time offender, Hodge was given three years of probation and must undergo a rehabilitation program. He is banned from coaching college tennis for 12 months. See the Athens Banner-Herald for more on the sentencing. The controlled substance in question is said to be Adderall. Spencer Furman, a sophomore on the Duke team, has been provisionally suspended by the ITF for failing a drug test earlier this fall. Furman, who was competing in the qualifying of the Cary Challenger back in September, was found to have the stimulant Damphetamine in his system. 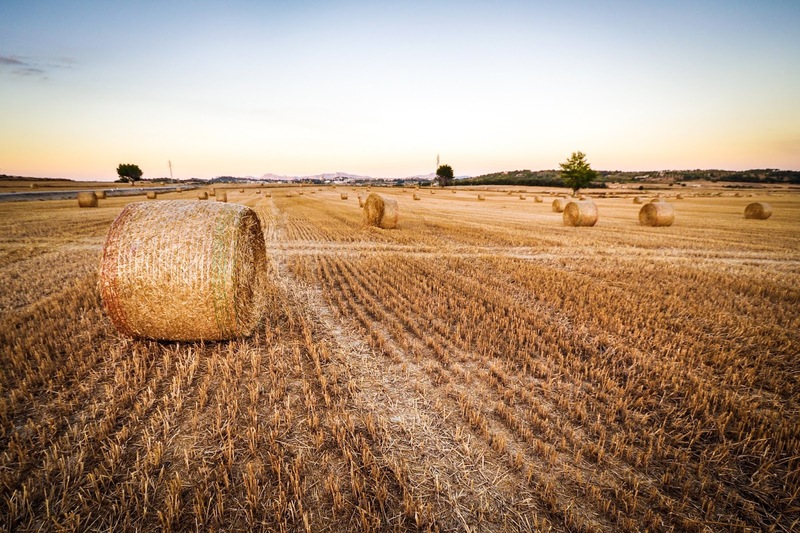 I have been told that Furman has a prescription for the medication, commonly prescribed to treat ADHD, but did not have the required Theraputic Use Exemption on file. The ITF's new commitment to transparency, which has been in response to the awkward "silent bans" of the past, means that failing a test will be reported, regardless of the circumstances. In any case, Furman's predicament, which will not affect his collegiate eligibility, is a lesson for all players who are just beginning to play pro events and may not have read the regulations pertaining to this facet of the sport. It's imperative to understand what the anti-doping rules require of you if you are taking any medication or you could face a lengthy suspension from ITF sanctioned events.